One of my all-time favorite shows is Buffy the Vampire Slayer...actually, it's probably The all-time favorite. My blogonym comes from a character in the show. Well, there's an episode where one of the bad guys shoots Buffy and as she and her friends hunt him down, she says "I find getting shot very motivating." Losing all my games last week, was very much like that. I've been studying up a storm ever since and even though my friend Ugarles managed to crush me in a game of Wordscraper yesterday, (I hate him and his little whap, too!) I've been feeling a greater confidence in my game. So much so that when Woody, one of the expert players at the club, showed up early, I asked him if he wanted to play. I've only played Woody once, maybe a year ago, and it was such a disasterous blowout that about six rounds in we simply switched to him playing his rack and telling me what he'd do if he had my rack. This time was different. I started off poorly, playing Tom instead of Mot because I doubted my grasp of the threes. This led him to play boxy/tomb I then drew a rack of einortu, but there was nowhere to put my bingo, so I got rid of the crap letters playing off my new favorite word: roue (also euro) and then picked up aniy, he played Taj hanging off the triple line, so I bingoed with inanity on the triple line hooking an I off raj. He challenged it off because raji was no good. Waa. I played Tinny, he bingoed on the triple line with earners. It was not looking good for our hero. But I picked up another good rack, and double double bingoed with toadies to get back in the game. He opened up another triple line and I played zoea for a crapload of points and to tie the game. I bingoed again with something simple and took my first real lead, he mounted a brief comeback, but I was able to play qat with the q on the TLS for thirty-odd points. It was a nail biter till the end, but I managed to go out and with the tiles on his rack I won by twelve! I couldn't believe it! I was in such shock I barely registered that I'd be playing my nemesis Adam in the first real game of the tournament. He had recently discovered my blog and swore to punish for everything bad I wrote about him. "I think the word was dork" he say after playing some disgustingly high scoring word like "quare" with the q on the TLS going two ways and the e on the DWS. SICK! I had opened with Hex, and then bingoed with "forties" making sox and ewe as well, he exchanged and instead of exchanging my double ui, I played them off, setting up his quare move. Boo. He went back and forth, he pulled head toward the end, but I managed to go out first and get the tiles on his rack. He did the math and in the end...we tied! Afterwards Joel showed me two plays that would have scored huge (glidepath for a TWS or icily, neither of which I saw. So he yelled at me.) I played Nancy next. We always manage to create a horrid blocked board early on, so I was making very low scoring single digit plays, using one or two letters. I played an a and e off a v, for ave, setting up Nancy to bingo with retinal. Boo. It opened up the board though and I managed to bingo a few turns later with denials. It was a close game, and then I drew esquire! She didn't block my one spot for it, so I pulled ahead by what I thought was a comfortable 60 points, right up until she scored 53 with jinn, with the j on a DLS and the blank on the triple word. So gross. We went back and forth again, but I pulled a lucky ess and was able to play hours for a bunch of points with no more tiles to draw. Whew. I have nothing to say about my third game. I played like crap (case in point, I had aasnier and knew that was a stem, so I played off an a and hoped for the best, I drew another ess. So I had aeinrss. I played raisens. Joel was standing over my shoulder and when my opponent instachallenged, he said "no good" and snorted.) I then played off "ar" hoping to draw a t. I didn't. I didn't stop hoping. Horrific. I scored 6 points or less five turns in a row. Blah. Anyway, my last game was with a guy I'd never seen before, so I assumed I would beat him. He played gama. I challenged. I lost. Uh oh. 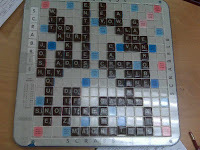 I bingoed with snottier, he used my e to make equine with the q on a TLS and the e on a DWS for 70 points. I triple worded with Josh, he bingoed with magnetic. Arrrgghhhh!!! I was losing and losing bad, my only hope was to bingo AND that he'd go over on the clock, I had like 15 minutes and he was already down to 3. Sure enough he went over, he was already at minus 20. But I was behind by 50, I played vow to open a bingo lane for myself...the only problem was I didn't have an a and I didn't draw one. In the end I was down by sixty. There were no more tiles in the bag and an open L and an open T. My rack was eeilrts I had a lot of time, so I shuffled and reshuffled till I finally came up with "retitles" through the t and hooking the s to ado. He sat and thought for a long time, costing him another ten points, before he challenged "ados." It was good! I managed a three point win! Woo! hahahaha ... and I love reading about your exploits there! Yup, Scrabble can turn normal respectable people into crazy idiots - I know, cos I''m one too (though right now we have a month OFF Scrabble over our summer holidays). hahaha, aint that the truth. My second favorite trick is drawing to bingo racks that I haven't studied!